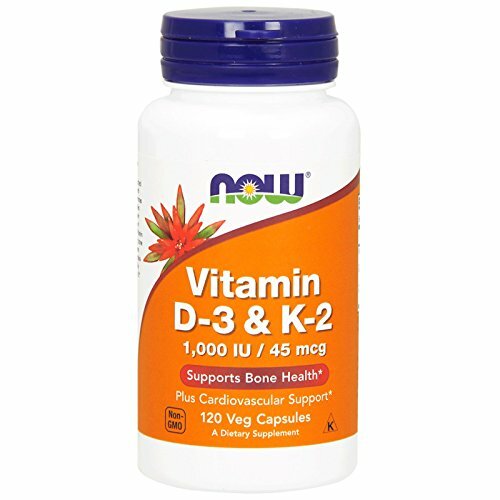 "Vitamins D and K with Sea-IodineTM 60 capsules Item Catalog Number: 01572 An avalanche of favorable studies has resulted in record numbers of Americans supplementing with vitamin D. Since it is virtually impossible to obtain adequate vitamin D from food sources,"
Vitamin D-3 & K-2 1,000 IU / 45 mcg Supports Bone Health Plus Cardiovascular Support* NOW® combines two nutrients extensively researched for their benefits for the bones, teeth and cardiovascular system. Vitamin D3 promotes calcium absorption and calcium transport to bones. Recent studies indicate that Vitamin D3 may support healthy insulin action and glucose metabolism and may have a positive impact on immune function. Vitamin K2, likewise is beneficial in the areas of bone and cardiovascular health. Vitamin K is critical for the formation of healthy strong bone matrix. Bone quality is dependent on the presence of adequate Vitamin K. Vitamin K's role in arterial health revolves around its ability to support proper calcium metabolism in vascular structures. 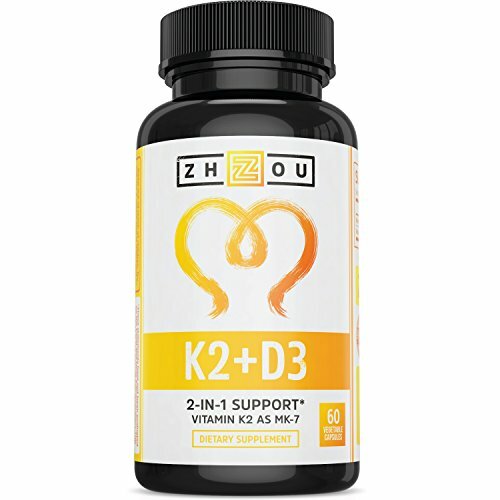 Vitamin K2 is the most biologically active form of Vitamin K.
An avalanche of favorable studies has resulted in record numbers of Americans supplementing with vitamin D. Since it is virtually impossible to obtain adequate vitamin D from food sources, supplementation with 5,000-8,000 IU daily is required by many aging individuals. Overlooked by almost everyone (except Life Extension members) is the critical importance of vitamin K. If one is concerned enough about their health to take higher dose vitamin D, it seems absurd to miss out on the benefits of vitamin K. For instance, vitamin D facilitates calcium absorption into the bloodstream and thus plays an important role in maintaining bone density. Less recognized is the need for vitamin K to transport calcium from the bloodstream into the bone. Vitamin K is also required by calcium-regulating proteins in the arteries. Together these two vitamins help maintain youthful calcium skeletal distribution while promoting vascular health. Vitamin D-3 & K-2 60 VegCapProduct DescriptionThis formula combines high-potency natural source D-3 Cholecalciferol with a clinically supported serving of K-2 Menaquinone-7 from fermented chickpea.Suggested Use As a dietary supplement take one vepcap daily with a meal or glass of water. Store in a cool, dry place. - Or as directed by your healthcare professional.Supplement FactsServing Size: 1 Vegetarian CapsuleServings Per Container: 60Amount Per Serving% Daily Value***Vitamin D3 (Cholecalciferol)5000 IU1250%Vitamin K (as Menaquinone-7 from Chickpea) (K-2)50 mcg63%Calcium (as Calcium Phosphate)110 mg11%Phosphorus (as Calcium Phosphate)84 mg8%*Daily Value Not Established***Percent Daily Values are based on a 2,000 calorie dietOther Ingredients: Vegetable Cellulose Capsule, Cellulose, Glycerol Monostearate, Rice Bran Extract and Silica.Warnings: Keep out of reach of children. As with all dietary supplements, consult your healthcare professional before use. See product label for more information. Since it is virtually impossible to obtain adequate vitamin D and Vitamin K from food sources, supplementation with 5,000-10,000 IU daily is required by many aging individuals. Like vitamins D and K, few Americans obtain optimal amounts of iodine. 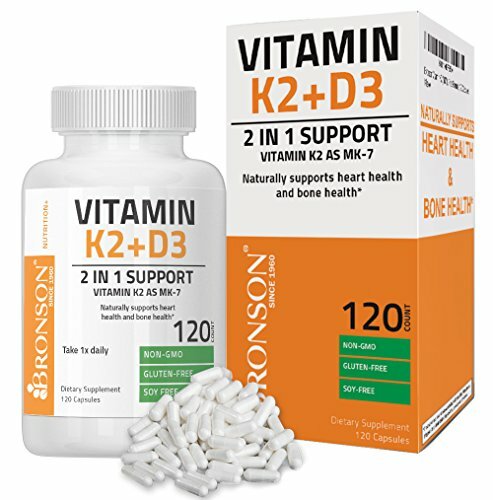 Bronson's K2 + D3 provides just the right amount of each essential vitamin to maximize their benefits to your bones and heart. No more, no less. Vitamin D (specifically D3, the form of Vit D you get from the sun) is essential to for properly absorbing the calcium we all know is so important as we age. Without D3, you may be missing out on benefits from the calcium in your diet. Most people start taking Vitamin D3 after they experience signs of deficiency. You may have heard that D3 shouldn't be taken alone- and it's true! Let us explain. While Vitamin D ensures that calcium is absorbed, Vitamin K2 (specifically as MK-7, the most bioavailable form) directs it to areas of your body such as your bones, so it can be put to good use. Without K2, the calcium absorbed may be deposited in the arteries, where it can lead to calcification or other issues. 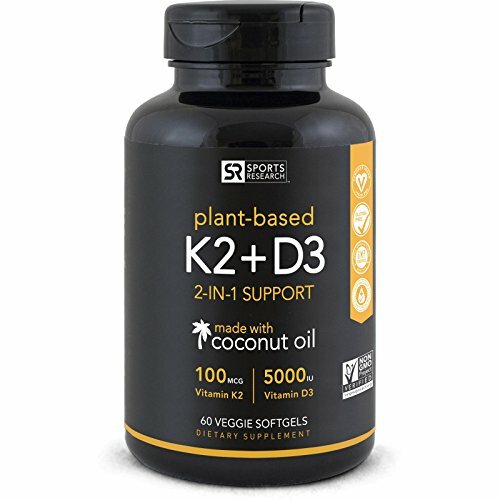 Bottom line, Vitamins K2 & D3 are truly the perfect pair. If you're serious about supporting healthy bones,experience the benefits of Bronson's K2 + D3! 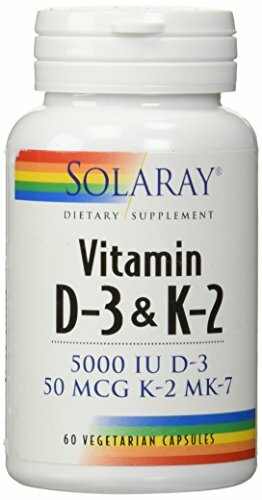 Since it is virtually impossible to obtain adequate vitamin D and Vitamin K from food sources, supplementation with 5,,000 IU daily is required by many aging individuals. Like vitamins D and K, few Americans obtain optimal amounts of iodine. 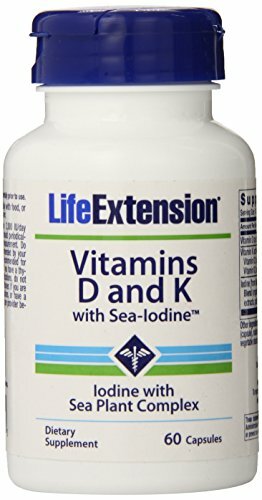 Compare prices on Vitamin D And K at ShoppinGent.com – use promo codes and coupons for best offers and deals. Start smart buying with ShoppinGent.com right now and choose your golden price on every purchase.